While it is no surprise that the staggering events of the Men's Elite race on Sunday are taking the headlines both in and out of the sport, it was also the final day of competition for the Age-Group athletes, racing over the Standard distance. The fastest two female athletes overall were both Brits, with Alice Jenkins and Emma Deary taking Gold in the F20-24 and F25-29 categories respectively. 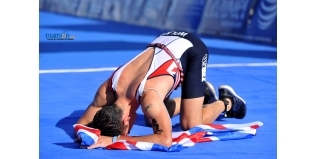 After taking Gold in both the Sprint Triathlon and Aquathlon events respectively, Michael Smallwood almost made it a golden triple, taking Silver in the 70-74 category. In the 55-59 category, Caroline Whittaker has her own 'Brownlee' moment on the finish line, crashing into the finish gantry and collopsing across the line. Her efforts were reflective of a seven minute winning margin however, adding to her Silver medal (lost by just two seconds), in the Aquathlon. The fastest British Age-Group male athlete overall was Benjamin Goodall - he finished eighth in the M20-24 division.